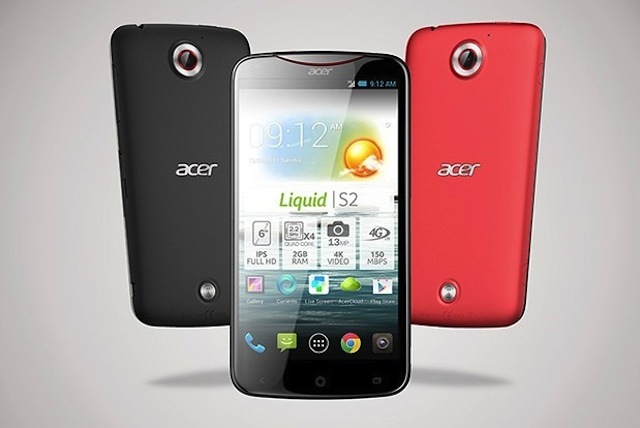 Acer may not be a household name in the Canadian smartphone industry, but a few years ago it was the equivalent of, say, Huawei in the public’s mind share. Today, the company has announced a new series of devices, including a flagship device, the Liquid S2, that boasts some impressive specs, but nothing to differentiate itself from the deluge of high-end smartphones hitting the market over the next few months. The 6-inch device looks, at least from the front, like an oversized Nexus 4. It has a 1080p display, a 2.2Ghz quad-core Snapdragon 800 processor, 2GB of RAM, a 3300mAh battery, Android 4.2.2 in an 8.9mm frame, and a 13MP camera that boasts 4K video capture. The de facto recording standard should be 1080p at 60fps, but 4K should be possible at 30fps. Most impressive is the inclusion of the flash within the lens ring, obviating the need for a separate module. Though the S2 is unlikely to come to North America, we should be seeing Snapdragon 800-powered devices announced over the next few weeks, including the Samsung Galaxy Note 3 and the Xperia Z1. While the S2 will only be available in a 16GB variant, the Iconia A3, Acer’s newest tablet, will come in both 16 and 32GB models. Unfortunately, the tablet is otherwise unremarkable; a 10.1-inch 1280×800 pixel display, a quad-core Cortex A7 processor, 5MP rear camera and microSD slot, and a price of around $350 CDN. Not bad, but nothing special.